There are 100’s of tournaments and events for top level players throughout the year that draw some amazing talent. We’ve been to a few. Problem is, there’s sometimes few if any college coaches at many of them and that’s for the simple fact that there are so many options, they can’t be at everything. While most schools have 3 or 4 coaches involved, in the majority of cases only 1 or 2 of them are responsible for recruiting. The Head Coach and sometimes one of the assistants will spend their summer and fall scouting players. With a finite number of weeks to discover talent, these coaches have no choice but to commit what little time they have to the tournaments and showcases that will provide them the best opportunity to find the student-athletes that fit their program. Online Profiles Matter And they matter a lot more now than ever. In fact, having multiple online profiles with different platforms is a GOOD thing. 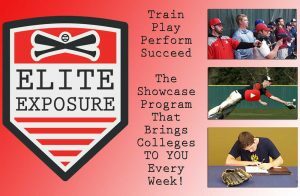 Perfect Game, Prep Baseball Report are examples of groups that are highly accessed by college coaches around the nation. Many coaches use both in their recruiting process. When a coach sees a player at an event that sparks their interest, in many cases they will jump online, ‘Google’ the player and take a deeper look at search results. This will include any High School stats they have along with their profile pages. This “digital resume” will help build a bigger picture of the player and aid in the recruiting process. Shake As Many Hands As You Can You are selling yourself at all times. Face time is invaluable and can sometimes make all the difference in the world. If you have an opportunity to look a coach in the eye, have a chat, shake hands and say “Thank you”, DO IT! Don’t ever pass up that type of opportunity. Be Your Own VP Of Sales & Marketing Getting recruited to play college ball is a highly competitive space, just like the business world. There are good players who get unnoticed because they have not embraced that fact. Knowing how to communicate with coaches, how to write emails, how often to follow up are, among other things, all part of a strategy you must have in place, and be prepared to stick to when promoting yourself. If you don’t play H.S. Varsity, you won’t (or can’t) be recruited to play college ball. FALSE. While not as common, we have had players come through our program that have gone on to college ball that HAVE NOT played Varsity ball in High School. Since the recruiting path has changed so much – tournaments, showcase events, etc, players have a lot more opportunities to get noticed and recruited. The coaches will find me if I’m good enough One of the greatest myths that, when true, only applies to a tiny percentage of players – the pitcher that tips the scale or the player hitting over .500. Think about how many great players you know, that aren’t in either of those categories. Probably a lot, which means when college coaches are looking at the pack, they see a lot as well. You’ve got to put the time and work in to get proper exposure and get noticed! It may surprise you to hear that these are but a few of the things to remember as you go on your journey. Players should be aligned with coaches or an organization that is prepared to travel the road with them, filling in the blanks, answering questions, providing guidance and of course training them at a high level so when their moment to shine comes, they are FULLY prepared!